Bed bug is an insect which is almond shaped, roughly around 5 – 6 mm. They range from the initial pale beige to a beetle shaped reddish-brown in colour after feeding. Bed bugs have well developed antennae and their feet have claws, which they use to either crawl or be carried in clothing, luggage or furniture where they can hide, so you will need to be careful when travelling. It has been known for a Bed bug to survive for six months without food. The adults need to feed every week and can live for up to 4 years. Without treatment the problem will not go away ! 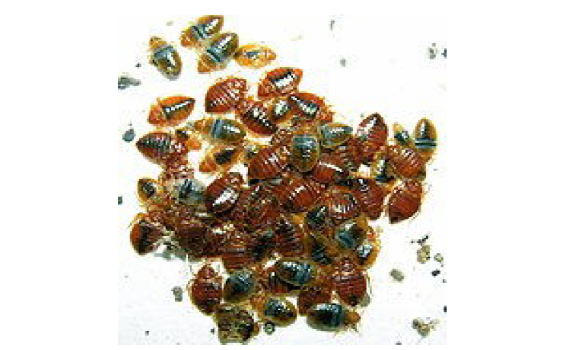 Any home can be invaded by Bed bugs, however most infestation are within the bedroom. These creatures both young or adult like to hide out of sight in cracks and crevices during the day, they are mostly found in bed frames, mattresses or behind skirting boards or even behind wallpaper. They only come out just before dawn, to feed on the blood of sleeping humans. Once feeding commences they will lay about 10- 50 eggs daily and take up to 20 days to hatch, they will mature to adulthood within 18 weeks. Bed bugs & disease ? Bed bugs are very unpleasant insects, their droppings leave a spotted appearance in the cracks and crevices they live in, they also give off a distinctive odour from their “stink gland”, leaving the room with an almond-like smell when the room is infested with Bed bugs. It is not known whether they carry disease, their bite can cause some people to react with a severe skin irritation. It has been known to cause some to lose sleep and become lethargic particularly in children. Good hygiene standards will need to be maintained as this will highlight the problem at the early stages. Control are determined to make this problem a pest of the past. from you is a room that is awaiting cleaning and staff training time. are unable to use due to an infestation or the cost of treating the infestation and more importantly your reputation. Our trained staff will answer your questions and arrange an appointment.